The story behind the name: The constellations that are included in the Zodiac - the 12 constellations recognized by Babylonian astronomers through which our Sun, moon, and planets appeared to travel during the course of a year - are considered to be among the oldest sky patterns recognized by human civilizations. They were thought to have more significance because they were touched by the Sun. Virgo rose in mid-August when the Zodiac was created by the Greeks and Babylonians so the sign became a marker for the ending of summer and the ripening of the harvest. Most of the fertility and harvest goddesses of the Mediterranean and Middle East are in some way associated with Virgo but there is no one definitive myth that defines this pattern. The pattern is pictured as a female, often holding a spike of grain in one hand. Virgo is the second largest constellation in the sky after Hydra, and the Sun spends a long time within its boundaries. The Sun is still within Virgo at the autumnal equinox, another point significant to ancient harvest and fertility rituals. 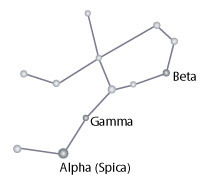 These associations can be seen in the names of some of Virgo's main stars: Spica (spike of grain) and Vindemiatrix (wine gatherer). Sometimes Virgo is holding a staff, a caduceus (the snake-entwined staff that symbolizes healing, rebirth, or oracle prophecy), or a scale in her other hand. These other symbols are associated with additional goddesses who symbolize justice or wisdom or prophecy. Many of the goddesses linked to Virgo are associated with stories in which a king or male god dies (symbolizing the coming of winter) and is reborn again in the spring, or in which the goddess enters the underworld to find him and cause his rebirth. In other variants, the goddess herself, representing the bountiful Earth, divides her time between the upper world and the underworld, returning above ground in the spring. Among the goddesses associated with Virgo are the Babylonian Istar, the Egyptian Isis, Sumerian Ishtar, Greek Demeter, Demeter's daughter Persephone, Roman Ceres, Dionysius's daughter Erigone, Greek Dike, Athena, or Artemis - and many others. Virgo is also important in an ancient Chinese belief which is based on the passage of the moon, not the Sun.